Church of Christ Lesbian: Story time - A Pride Story She couldn't walk away! Story time - A Pride Story She couldn't walk away! There she was, listening to him spit out his vial words. Wondering how this was to lead people to God. 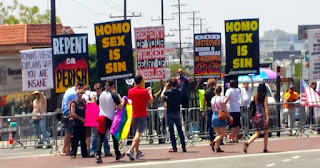 He shouted things like "God hates your sin and you won't go to heaven" and "You are evil" He was turning red with anger and you could see his frustration that people were not listening to him, or if they were, they were not doing what he wanted. Julie, a newly baptized Christian, feeling a little spunky, just couldn't sit there though and watch this without saying something. Though she had just been baptized, she was raised in the church. She knew the Bible inside out. She studied it and read all she could about the scriptures that were against homosexuality. She also read many more. Here was her chance, she had blown it when her father came at her, but now, she knew she could do it! Walking firm holding on to her cross necklace, she marched up to the guy, through the crowd, and got his attention. She then quoted scripture to him, Starting with Matthew 7:1-5 Do not judge, or you too will be judged. 2 For in the same way you judge others, you will be judged, and with the measure you use, it will be measured to you. 3 “Why do you look at the speck of sawdust in your brother’s eye and pay no attention to the plank in your own eye? 4 How can you say to your brother, ‘Let me take the speck out of your eye,’ when all the time there is a plank in your own eye? 5 You hypocrite, first take the plank out of your own eye, and then you will see clearly to remove the speck from your brother’s eye. "You have a plank of homosexuality in your eye mam, get it out before you burn!" he spatted back. She came at him with "Luke 6:37 Do not judge, and you will not be judged. Do not condemn, and you will not be condemned. Forgive, and you will be forgiven." "I am to tell you of your sin, I am to to judge you! You are living in sin! You are an abomination to God, you are going to Hell"
"You can judge for God?" She comely asked. "He has charged us to deliver each other from sin, and you are living an unatural lifestyle!" he yelled at her. "Unnatural? Then why are there animals who are homosexual?" 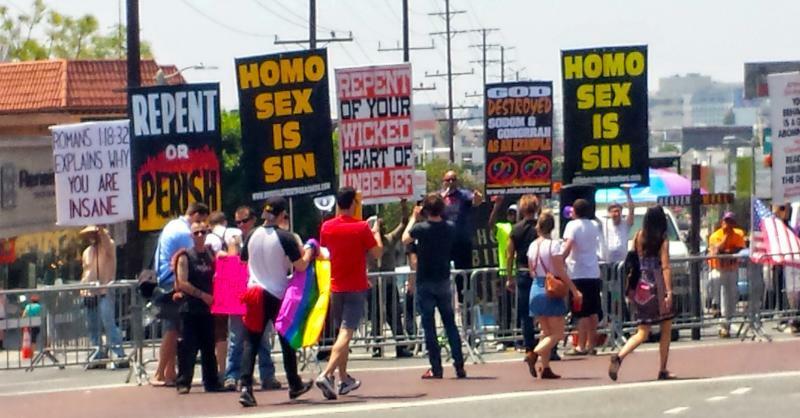 "Because they live in sin!" "Yes because of Adam and Eve, all creatures sin!" "You are not a Christian and you must be born again and repent!" "Do you even know what that means?" "I asked you first" His voice still raising and yelling at her. "John 3 tells us we are born again when we are born through the water and spirit aka baptism, full immersion, done after admission that Christ is the son of God and our Savior." Julie replies calmly. "No, you don't know, and if that is what you believe then you are not born again!" He yells at her. Seeing that she was not going to get any where and that the crowd was getting restless and that they were starting to want more then an argument with the guy, Julie thought quick. She spouted out one more scripture "Romans 14:1-4 Welcome with open arms fellow believers who don’t see things the way you do. And don’t jump all over them every time they do or say something you don’t agree with—even when it seems that they are strong on opinions but weak in the faith department. Remember, they have their own history to deal with. Treat them gently. For instance, a person who has been around for a while might well be convinced that he can eat anything on the table, while another, with a different background, might assume he should only be a vegetarian and eat accordingly. But since both are guests at Christ’s table, wouldn’t it be terribly rude if they fell to criticizing what the other ate or didn’t eat? God, after all, invited them both to the table. Do you have any business crossing people off the guest list or interfering with God’s welcome? If there are corrections to be made or manners to be learned, God can handle that without your help." "I will never fellowship with anyone that doesn't see it my way as it is God's way!" He shouted at her! "Then you leave me one choice!" She calmly said. Then Julie took a deep breath, braced herself, and with the loudest voice she could muster, she let out these words: "Heavenly Father, God above all, Hear our prayer, bless us this day and bless this man and bring peace to him and help him deal with this ego that he has. Help him find that he does not have to find the specks in others eyes when he has many in his own to deal with. It is okay God, I know he thinks he is doing your work, but he doesn't know the damage he is doing. Help him move on and find a better use of his energy. God, loving father, we bow before you, We your people help us show your love to those that don't show us your love. Help us show your mercy that won't think twice to show it to us. Let us show that we are all your children! God, great Father, walk with us guiding us in love! It is in your son's name we come, amen!" When Julie opened her eyes, he was silent, he picked up his speaker and walked away. The crowed cheered. And Julie started one last thing she got them to chant, God is love! Proud of herself, she whispered, "Thank you God, you did that!"